Corrosive Resistance: The inert nature on an anodized coating provides excellent corrosion resistance. Hardcoat will pass the 1,000 hour 5% salt spray test (@ 2mil) (ASTM B 117). 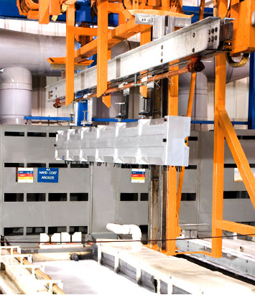 Corrosion resistance of more than 1,000 hours is available with additional sealing operations on Hardcoated parts. 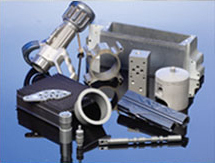 Prevents Galvanic Reaction: Hardcoat aluminum /alloy can be used with a wide variety of other metals such as steel, brass or bronze due to insulation properties. Lubricity: In many instances a Hardcoated part can run against another Hardcoated part without lubrication. Ice does not form on Hardcoated surfaces. Hardcoated surfaces impregnated with Teflon® (PTFE) have an even lower coefficient of friction. 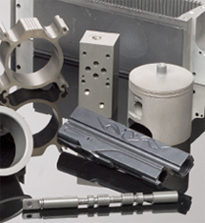 Thermal Properties: Hard anodized coatings have very low thermal conductivity and expansion. Ideal for internal combustion engine pistons and when dyed black, excellent for use in solar collectors with no need for additional paint. Uniformity: The Hardcoat process follows the contour of the part with a uniform build up allowing for very close tolerances and effective coating on unusually shaped parts. Wear Resistance: 10X greater than unanodized aluminum. Standard Tabor Testing has shown Hardcoat aluminum in 2X greater than Cyanide Case Hardened Steel. Workability: Parts may be machined, ground, dyed, painted or sealed. High tolerances may be achieved with alloy consistency. Color and Finish: Natural finish is determined by the Aluminum alloy and range from tan to dark grey or black. Your cast part may also be given our MetaBrite® treatment for a brighter more polished appearance.